For part of this series, I interview Joan Liu, a counselor at a high school in Southeast Asia, who has been working on the front lines of access and equity issues during her career. Wait ‘til you hear her story: this past April, the University of Texas at Tyler first accepted more than 60 Nepali students with full scholarships and then--get this--they emailed those students to say that, due to a clerical error, those students would no longer have a full ride at UT Tyler. Like: sorry. Like many of us in the counseling community, Joan couldn’t believe this when she heard it. She decided to do something about it. That story--and what happened next--is what we discuss on this podcast. This story was picked up by the Washington Post, the Chronicle of Higher Ed and they are seeking help for these students--we’ll let you know at the end how you can help. Enjoy. [6:00] How did this happen? [6:42] How likely is it for international students to get full scholarships to US universities? [19:04] How can folks help? Go to Everest Ed Fund to donate, offer help, or reach out for more information. Long-term, Joan and her team are raising 250K (covering 4 years) to make sure students can pay fees from year to year; and can graduate from college. Short-term, they need about 7K to get two kids to be able to move into sophomore year. Do you know someone who is in media; runs a YouTube Channel; runs a podcast; is a documentary filmmaker; is a student filmmaker? Joan wants to talk to them! Make an introduction. Link us to someone you know who might care enough to make a transformational gift. 5:58 How can parents be a part of the solution? It’s with Jed Applerouth, who is not only a close friend but also knows a TON about testing (he taught test prep for years, runs a Applerouth Tutoring and is one of the leading voices in our industry on test prep). This episode is incredibly practical. I asked Jed for 10 ways to reduce test anxiety and he gave me 25. It’s a video. So if you’re only listening to the audio version, go to collegeessayguy.com/podcast and click on the “Jed Applerouth” episode. Or just go to YouTube and search “College Essay Guy Test Anxiety Jed” and you’ll find it. I loved listening to Jed drop these 25 bits of wisdom--I hope you do too. 2:45 Who is Jed Applerouth--and what is “Pink Fury”? 5:31 Why is anxiety in education important? This episode is the first episode in Season 2 (yay!) and the first in a three-episode miniseries on testing. In this episode I sit down with Bob Schaeffer, Public Education Director of FairTest: the national Center for Fair & Open Testing, a non-profit that advocates for better forms of student assessment. Why is this podcast important? Some students assume they have to take the SAT or ACT or that all schools require these tests for all students--but that just ain't true, as Bob will tell you. In fact, Bob's got a list of test optional schools that he updates regularly, which I’ll let him tell you about. What are some other standardized test myths that people tend to believe? To what extent does the SAT or ACT measure what students need to know in college? Important statistics from “Crossing the Finish Line,” a book that outlines the research around how well standardized test scores predict actual student performance in life and in college. What is the difference between “test optional” and “test flexible”? If students don’t submit standardized test scores, does this have an impact on scholarships and financial aid? Does applying to a college without a test score hurt a student’s chances? I love the perspective Bob brings and I think this conversation is a great way to begin this little mini-series on testing (and Season 2)! Enjoy. 2:48 Who is Bob Schaeffer? 3:20 Are standardized tests evil? 4:24 What is the best determiner of high test scores? 7:05 To what extent does the SAT/ACT measure what students need to know in college? 7:30 How much do colleges need standardized tests in order to make their decisions? 11:06 What is the difference between “test optional” and “test flexible”? 14:13 Why do colleges choose to go test-optional? 15:21 What kinds of students benefit from colleges being test optional? 17:11 What do colleges ask for instead of test scores? 20:22 If students don’t submit standardized test scores, does this have an impact on scholarships and financial aid? 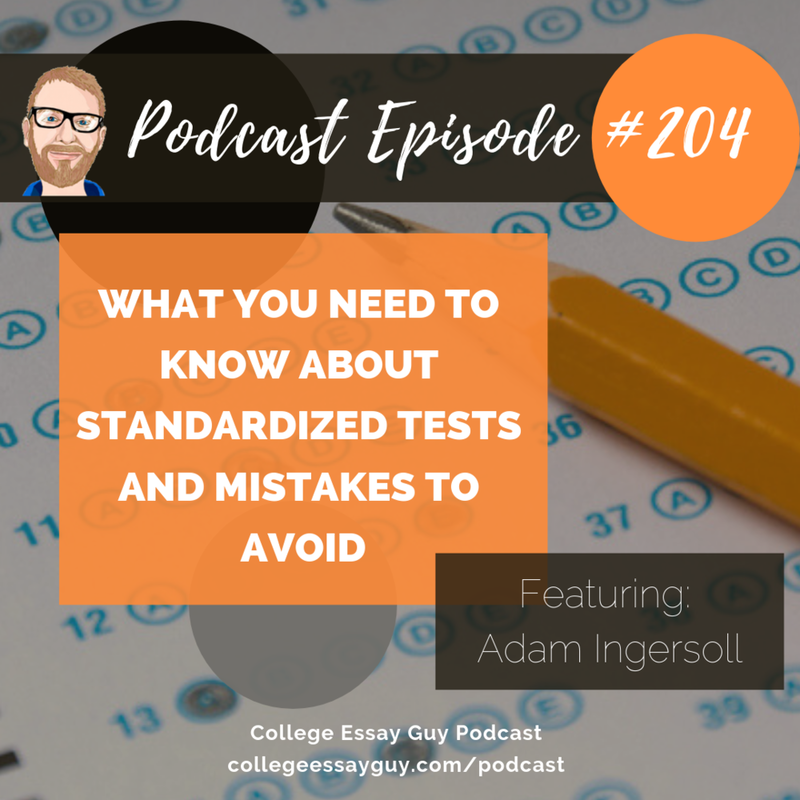 21:52 Does applying to a college without a test score hurt a student’s chances? Can a bad interview actually hurt your application chances? What’s the one thing that colleges are looking for above all else? 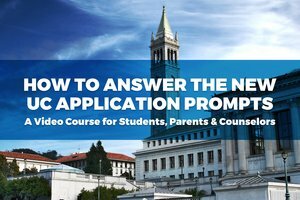 How do you answer the “Why this college” interview question? How do you answer the Strengths and Weaknesses interview Question? How do you answer the Tell Me About Your Reading Life or “What books have you read recently” question? What is the hardest interview question and how do you handle it? What if you get a “bad” interviewer? What if you’re asked a question in an interview that you truly don’t know the answer to? How much does body language matter in an interview? How do I handle a Skype or Phone Interview? What about Scholarship Interviews—are they different? Ethan’s List of Commonly Asked Interview Questions & the College Essay Guy’s Complete Guide to the Interview, in which you’ll find a workbook where you can record all your answers from the Guide. This is episode three of three with the amazing Jeff Levy and Jennie Kent. 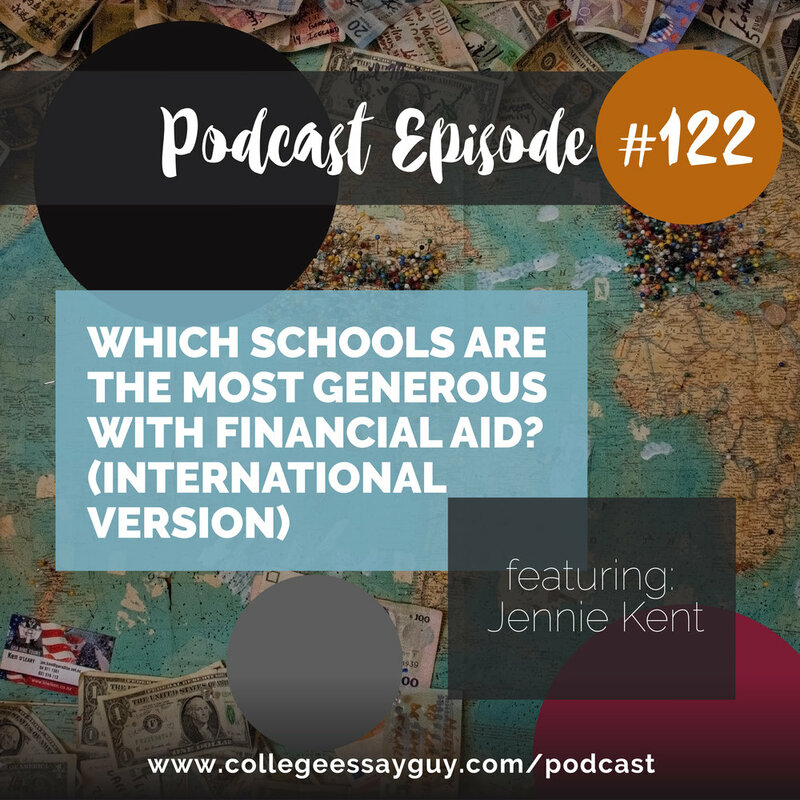 Last episode you heard from Jennie on Which Schools Are the Most Generous With Financial Aid… with International Students and on the episode before that you heard Jeff talking about which schools are most generous with domestic students (i.e. students applying from the US). 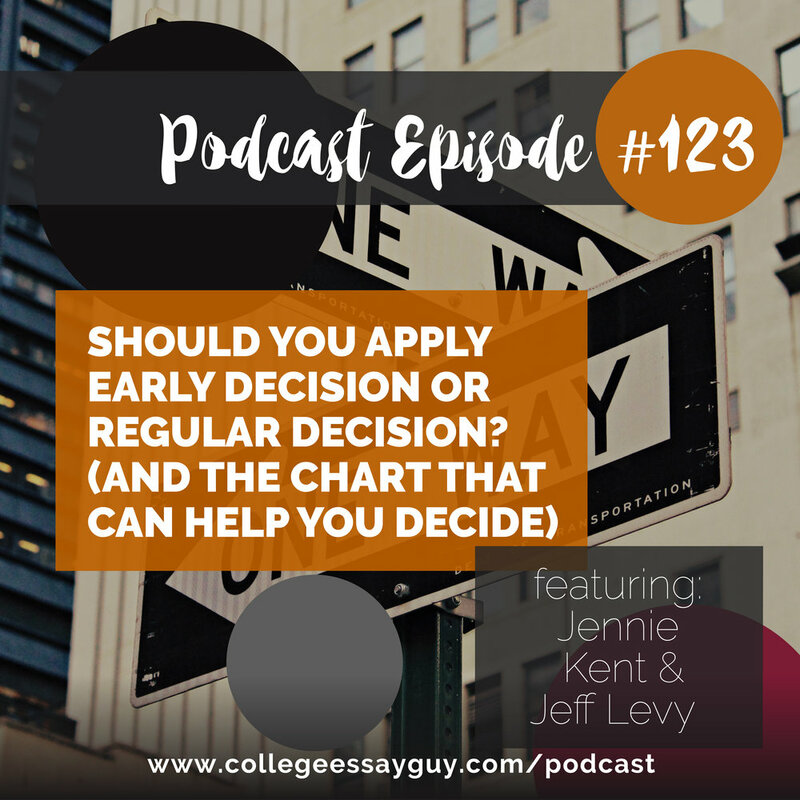 And it’s on a controversial topic: Should you apply Early Decision or not? Is there a statistical advantage to applying early or not? When making this decision, it might help to know what the regular decision acceptance rate is for a school and what the Early Decision acceptance rate for a school is and then compare those numbers. But imagine doing that for all the schools you’re applying to. In fact, imagine doing that for over 200 schools. Wouldn’t it be better if someone had done that work for you? That’s just what Jeff and Jennie have done. They spent weeks--maybe months--last year poring over college admissions websites, calling admissions reps, asking for their numbers so that they could put together for you, in a neat little spreadsheet, all this information. And then they did it again this year! Why did they choose the metrics they chose (i.e. why do these numbers matter)? Who is early decision right for and who is it not right for? How can you use this chart practically when applying to college? This is part two of three in my series with Jeff Levy and Jennie Kent. In our last episode we covered which schools are most generous with financial aid for domestic students (i.e students applying from within the US), while the episode you’re about to hear, with Jennie Kent, covers which schools are most generous with financial aid for international students (i.e. students applying from outside the US). Jennie and Jeff have painstakingly pored over many many college websites and talked over the phone with many many colleges to put together a spreadsheet that lists over 400 colleges and not only what their total cost of attendance is (because that’s easy to find), but what percentage of financial need they meet, and--get this--what percentage of students receive merit aid from the school AND what the average merit aid award is. So: how much money does the school give to international students and to how many students per year. I’m super excited about this episode as it’s part one of three in a series of incredible resources put together by my beautiful colleagues Jeff Levy and Jennie Kent. The first resource (which is the topic of this podcast that you’re about to hear) is a spreadsheet with a list of over 400 colleges and tells you what their total cost of attendance is, what percentage of financial need they meet--get this--what percentage of students receive merit aid AND what the average merit aid award is. Yeah, kind of nuts. I’m so so grateful to Jeff and Jennie for putting this information together. This episode is with Jeff Levy and covers financial aid for students who are applying to college in the US and who are from the US (in other words domestic applicants). The next episode covers how much financial aid is given to students applying from outside the US (in other words international applicants) and that interview is with Jennie Kent, since that’s her specialty. For the third episode I interview both Jeff and Jennie and they share with you perhaps their greatest resource… which I’ll tell you about on that episode. FYI: You’ll hear Ted’s voice at the start, not mine, since he was interviewing me for this one. Enjoy. 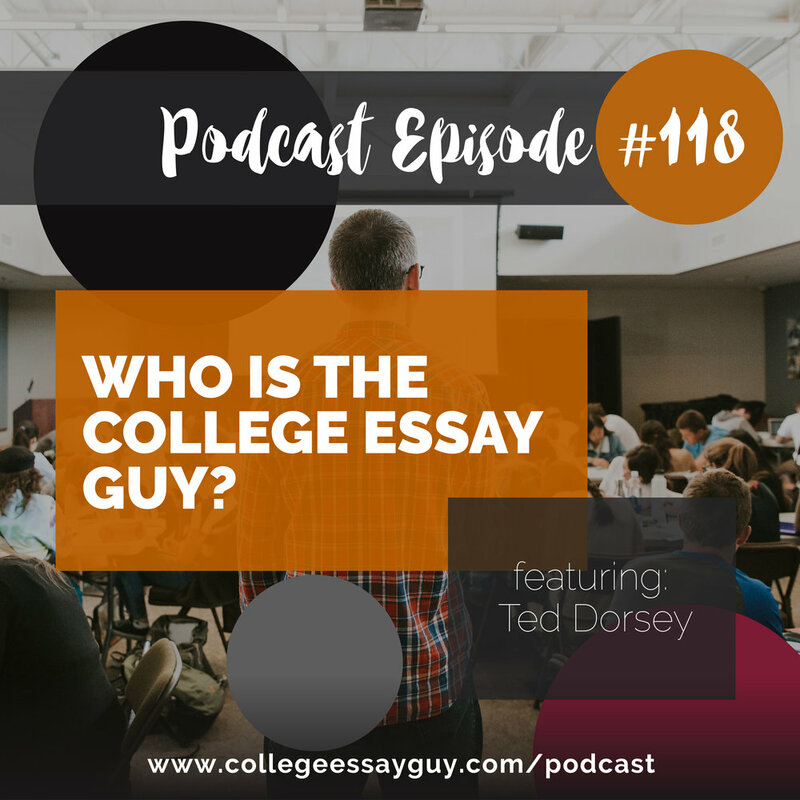 118: Who is the College Essay Guy? Typically my job is to take some of the most awesome and rad people in the college admissions world (I’m not sure if there is a difference, but I’m sure there is), analyze their genius, and break it down for you into practical and actionable steps whether you’re applying to college yourself or helping someone else apply. But this time, I’ve handed the reins over to my guest Ted Dorsey (AKA Tutor Ted), who has scored perfectly on the SAT, ACT, and PSAT, and let him do the podcast, where he’s going to offer up clear steps to improving your ACT score--in less time than it takes to bake a potato. He’ll dish up tips on how to use your calculator during the ACT, the importance of math vocabulary, why you need to be selective in your focus in the science section, and why writing a lot for the writing test can help. Even more tips to come! Stay tuned. This is the first of two podcasts with Ted Dorsey, also known as Tutor Ted, who scored perfectly on the ACT, SAT, PSAT and runs a cool test prep company called (what else?) Tutor Ted. 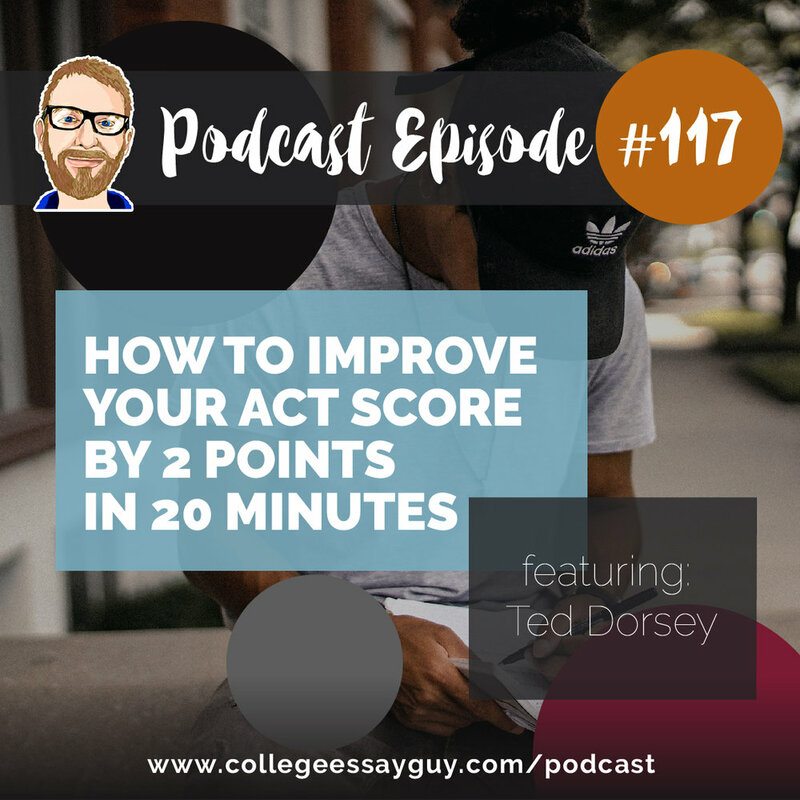 Now, in the second part of this podcast he’ll show you how to improve your ACT score by 2 points… in just 20 minutes. But before we get to that, I thought it might be great to get to know Ted on a more personal level--and what better way, I thought, than to take him through the exercises I use with my students when we’re brainstorming personal statements. Why? Because I use some exercises that go really deep, really fast--as you’re about to hear. So in part 1 of this episode you’ll hear Ted and I going through some of my warm-up exercises (which I actually call “vulnerability training” -- you’ll see why in a minute), so you’ll essentially get to see part of my brainstorming process in action. Ted will do (on the spot!) a distilled version of the Essence Objects and Values Exercises, which you’ll be familiar with from Episode 111 of the podcast, or if you know my book or my website. Then you’ll hear me walk him through my #1 favorite brainstorm, the Feelings and Needs Exercise (which has been called the “20 minute therapy” exercise--again, you’ll see why once we get into it). By the end you’ll know Ted a lot better and, even though we don’t talk about on this episode, you’ll see that Ted has some GREAT content for a college essay… were he to go back and write one. 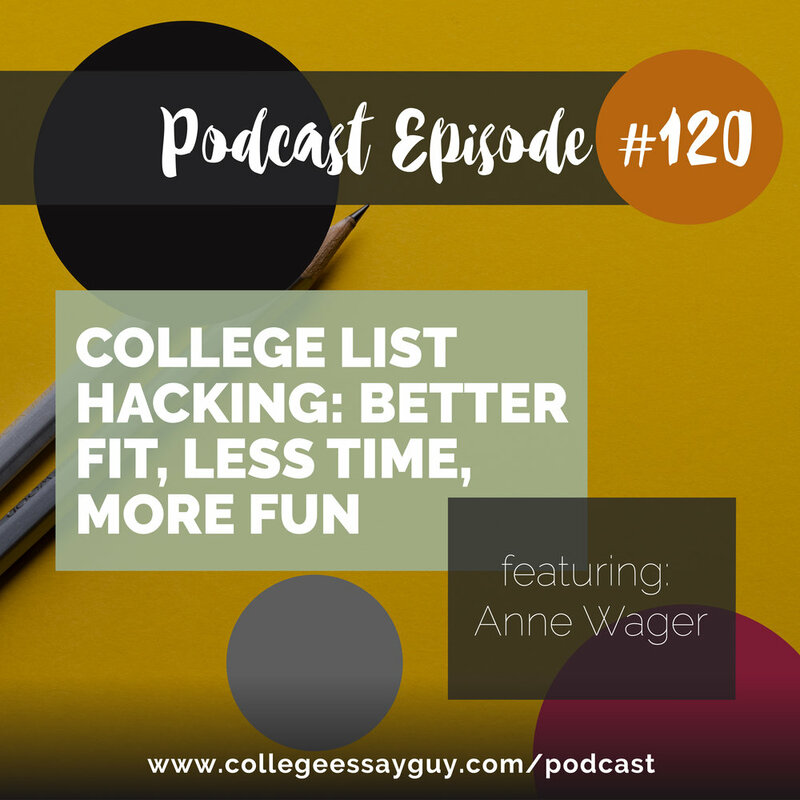 We’ll talk about what fit really means (according to Mark’s perspective), how you can use that knowledge when you’re searching for college--and even a gem that can help you settle in once you’re already on campus. If you know me, or if you’ve listened to the podcast before you know what a resource junkie I am… the same can be said, I think, for my guest on this episode, Shaun McElroy. Shaun is the publisher of two blogs: www.internationalcounselor.org which focuses on all things college admissions and which, I do believe, is one of the oldest continuously running blog on college admission (started in 2003) and www.strengthsmining.com focuses on applying research and principles of positive psychology into practice. And if you, dear listener, are a resource junkie like Shaun and I are, then this podcast will be like food to your soul -- -as Boyz 2 Men so beautifully put it in their 1997 hit “A Song for Mama” hashtag I love 90s R&B hashtag Nate Mike Shawn and Wan. You’ll hear me say at the start of our conversation that Shaun is going to share “eight” free college application tools… but once we finished I went back and counted and there were more like 25. For fun, I asked my editor Nathan to give a little [ding] every time Shaun shares a new resource. And do enjoy this fast-paced resource extravaganza courtesy of myself… and Mr. McElroy. www.strengthsmining.com all about applying positive psychology to your life. While there is no “practical guide” for this episode, if you’re interested in this topic I highly recommend that you click this link, where you can download a PDF of the presentation Laura Young gives on this very topic. It is so so good and I thank Laura for letting me share it. … and all that in the first 10 minutes! All this and more on this episode with Laura Young--please enjoy. An amazing PDF of a presentation that Laura put together called “Debunking the Myth of the Starving Artist” (yeah, like this podcast!) that has SO. MUCH. GREAT. INFORMATION. On this episode I interview an old friend of mine, Ben Mathes, founder of the Urban Confessional, which is a free listening project. A few years ago Ben started posting up outside bus stops and on street corners with a sign that reads “Free Listening” and he would do just that: listen. Over the last couple years it’s ignited something of a movement and Urban Confessional is now in 73 countries, 2000 volunteers strong, and has been featured in the Huffington Post, The Atlantic, Fast Company, The Big Think, Glamour Magazine, and in over 45 international publications. His blog, HOW TO LISTEN WHEN YOU DISAGREE, has been read over 2 million times and republished in over 100 publications across the world. They are currently the subject of a PBS produced documentary called "ARE WE LISTENING", and this year, they launched the HEARD PODCAST, which features honest conversations from visionaries, leaders, and other interesting people. On this episode we discuss how Urban Confessional started, what Ben has learned about listening over the years, how these lessons have impacted his relationships and even what it was like doing free listening at last year’s Republican and Democratic National Conventions. At the end he offers a great resource called the “Practice Partner Guide,” with some great practical tips for how to listen. It’s wonderful stuff from a wonderful human, as you’ll soon see, and the applications include, then go much beyond the college application process. 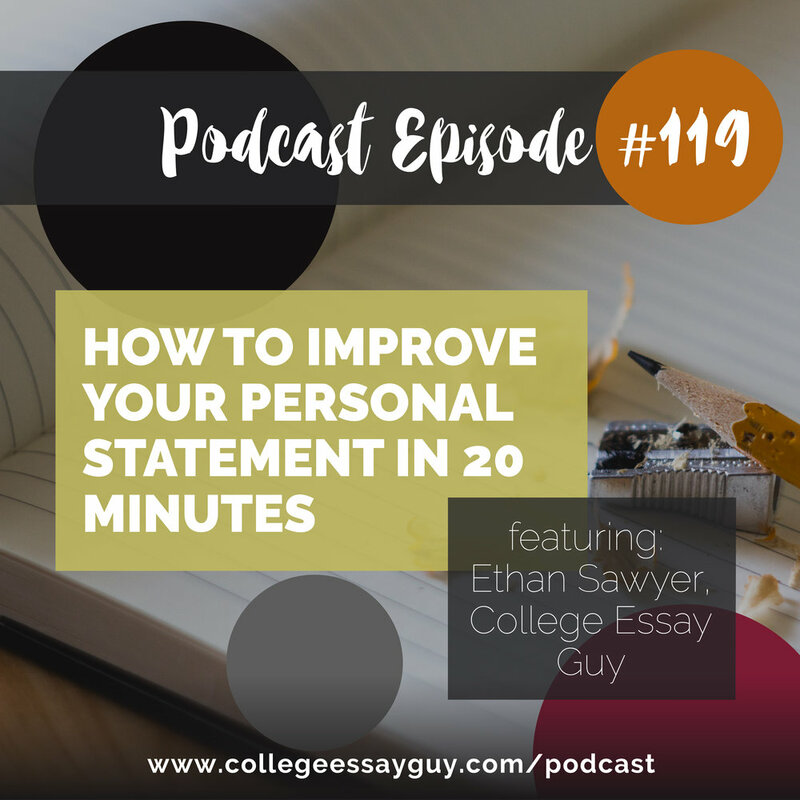 Welcome to the College Essay Guy Podcast, I’m your host, Ethan Sawyer, the College Essay Guy. What I’ll typically do in the podcast is interview folks from the admissions world and go deep into college admissions to try and generate practical and actionable steps that you can take with the goal of bringing more ease, joy, and purpose to the college application process. Now, because my specialty is the college essay, I thought I would take the mic for this podcast and share with you a presentation I started giving in 2011, called Using the Secrets of Screenwriting to Write Your college Essay. The story behind how I started connecting screenwriting and the college essay in the first place. Two exercises that I love to use to generate some great content for the essay. Two structures that I think can work for just about any essay. What I believe the end of an essay should do. And so much more! Enjoy. Who is the College Essay Guy?